She: Is anyone home? I see red. Heelllooo! She: No one answered. I know someone is home. Come closer! Take a look! Someone is brighter than you! He: I don’t think it’s safe to be that close. I like it out here. She: Take a chance, I’ll meet you on the arm of this chair. He: That’s as far as I’m going! She: See, there’s nothing to be afraid of here. You need to take a chance and explore the world a little more. Who knows what’s out there waiting to be discovered. He: You are right, look over there. Is that a bird feeder I spot? Let’s check it out. They flew away that day, but she continues to tap at various windows. He, however, stays back and has not come closer again. There are red states. There are blue states. Why can’t we just be United States? I’m beginning to think this divisiveness is taking over. While looking out the kitchen windows into our backyard, my husband began laughing, “Come here, you have to see this!” he exclaimed. The cardinals were gathered on the left side of the yard. The blue jays were on the right side of the yard. Keeping their backs to each other they flitted from one limb, to the ground, and back to the trees, occasionally pecking at some tasty morsel. They did not cross bird-lines, however, a redheaded woodpecker arrived. First he hopped up and down the tree on the right, tapping here and there. Not finding enough on the right, he flew to the tree on the left, repeating his dance from the previous tree. He paid the cardinals and blue jays no mind. He took care of his business, then left. I wonder if the cardinals and blue jays took notice that it is possible to live harmoniously even when not every one is just alike. Did they discover they can cross the bird-lines in the yard? An umbrella propped in the corner of a covered patio has become an evening-through-the-night roosting place for a roadrunner at my brother-in-law’s house, outside of Phoenix. Every afternoon between 3:30 and 4:00, a roadrunner wanders in from his (we think it is a male) day of hunting for food. He ambles about the patio, freezing into position if he senses movement behind the glass doors. When he feels safe, he continues his patrol of the patio. My brother-in-law reports that occasionally, he will tap on the glass doors. Sadly, he was not in a tapping mood during my visit during the holidays. After taking stock of his surroundings, he may fly up to the back of a chair to study his final destination, the top of the propped umbrella. Or he may decide to fly right to the top of the umbrella. Stanley is all puffed up trying to dry off. Believe it or not, it rained the days were were in Arizona. Once perched, he faces out so he can keep an eye on his surroundings. His tail is straight up and flush with the wall. That is his pose until he leaves in the morning. Departure is usually around 8:00-8:30. Since this bird has been roosting on my brother-in-law’s patio for several months, he was given a name, Stanley. Stanley does not take flight when you go out to view this curiosity. He views the intruder with an unblinking steely stare. Stanley, settled in for the night. He has become the finial of the umbrella. This is the tidiest bird ever. He has never left one dropping on the umbrella or patio. Now, I find that amazing! I’ve never known a bird not to leave a little disgusting reminder of their presence. Every morning, the patio corner is checked to see if Stanley stayed the night. Each evening his arrival is anticipated and noted. It will be a sad day when Stanley decides to relocate. Before I retired, Friday evening was my favorite part of the week. The weekend hours stretched like a slinky. 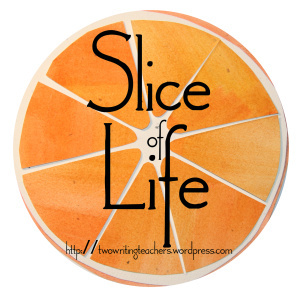 So many options to fill those moments, but like a slinky, time snapped back and the routine of school filled the days. Now that I am retired (but working part time in schools) Fridays don’t have that same magic. Instead the special time is mid-April into June. These days I savor just like a working-life Friday, but the joy of time lasts longer. Here is the time I get to play with my crafts, read, and read some more. No guilt lingering in my mind that says you have work to finish. I stop by the library with my list of book titles that I culled from various posts and walk out with a stack to last me for a while. I carry my sweet tea with a touch of lemon to the patio. Pull the chair into the sunshine, prop my feet on the ottoman to become lost in the world of the book. I hear it before I see it. The vibrating thrummmmmm hovers six inches from my face. The wings create a breeze, as the hummingbird scans my body looking for the nectar portal. I am as still as a marble statue, I relish the closeness of this contact. Moments later, it zoomed away searching for something with more nutritional value than my peach colored shirt. This moment caught in my mind, sadly not on my camera. 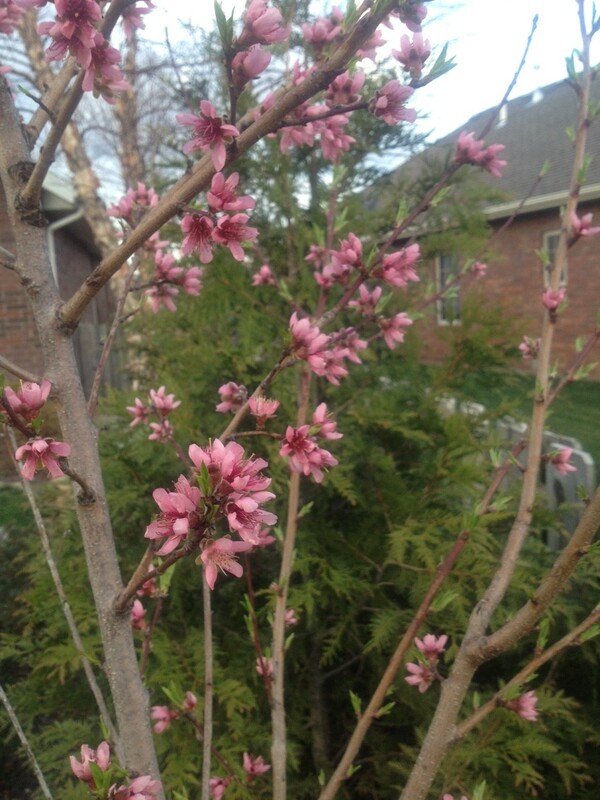 Last year a cold snap destroyed all the potential blossoms on my peach tree. Somehow four peaches managed to survive. In the fall we had the tree pruned. 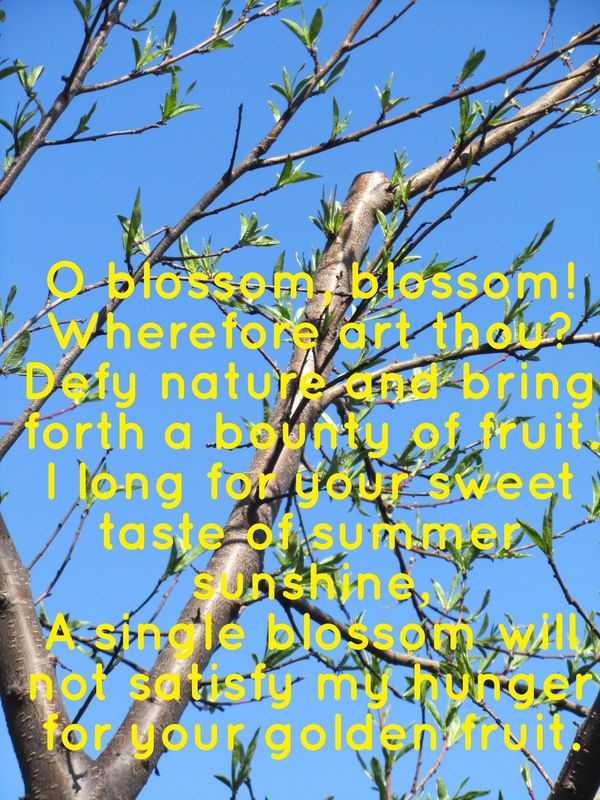 The arborist promised this action would create a plethora of peaches, plus it would allow the tree to develop to its greatest potential. I guess this means one peach. How sad! Eagerly I waited for the tree to burst into bloom. 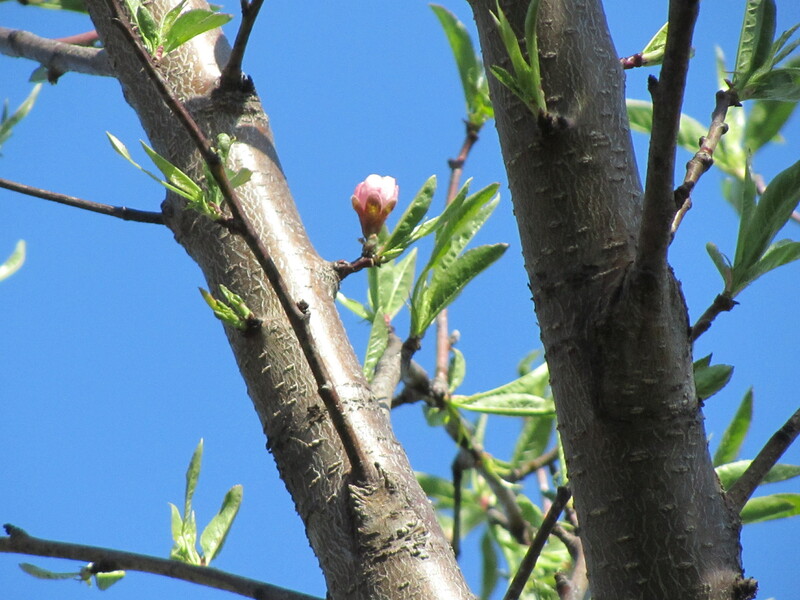 Then the leaf buds appeared, followed by leaves. Concerned, I studied my tree. A single blossom was all that I could find. My heart sank. Another year, no peaches in my yard. 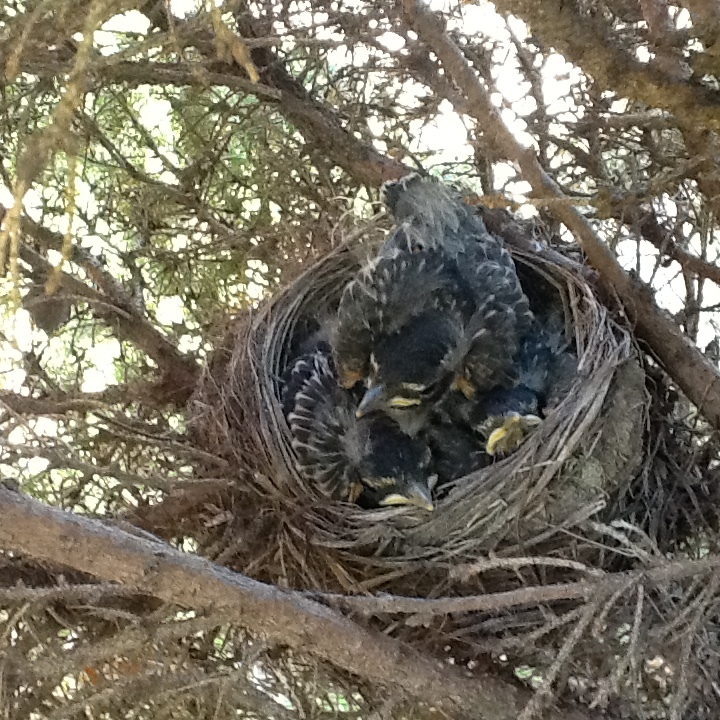 Update on bird status: Baby robins are now feathered, so soon they will be on their own and the tree will be removed.